Driving in Costa Rica – the good and the bad! Driving in Costa Rica has a lot of advantages when you travel. With a car, you get the freedom to do what you want and to travel where you want and there really isn’t any restrictions on when you have to leave or go places. But driving in Costa Rica has its disadvantages and also its challenges. So even though it is probably the best way to get around the country, it is also very important that you inform yourself about the general behavior of Costa Rica drivers and what to expect on the road. There are in fact traffic rules but Costa Ricans generally do not stick to them. Make sure you are vigilant at all times. On the Highway the speed limit is usually 90 km/h. The road signs are in kilometers and you drive on the right side of the road. Any tourist should be able to drive in Costa Rica with the license they obtained in their home country – as long as it is up to date. Use WAZE to navigate through the country. Ticos swear by this app as being the best GPS system. Perhaps you took a look at Google Maps and saw that most of the traveling times stated there are shorter. However, Google Maps does not consider the road conditions or indeed the mountain roads. It is a general rule that you have to add between 30 minutes to an hour to the traveling time Google Maps gives you. There is a big difference between driving in a city like San Jose and a more rural area. San Jose is best avoided during rush hour and it is safest to drive between the hours of 9am and 3pm. Costa Rica is investing quite a bit into its roads but even on the paved roads you will still encounter the occasional pothole, so take care. The more remote the destination, the rougher the road conditions. 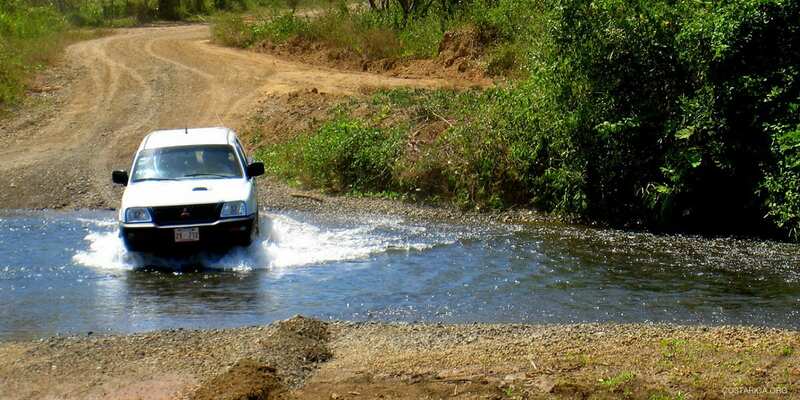 When traveling off the beaten path, especially when you plan on driving to a national park or a more remote area by the coast during dry season as well as rainy season, you should definitely contact your car rental and request a vehicle with four-wheel drive so you won’t have any trouble navigating the route. Driving in a new country can be intimidating but it is all about understanding the “driving language”. Here are some tips on how to be confident on the road in Costa Rica. Even though your natural instinct would be to use your blinkers before turning into a new lane, this is not necessarily how Costa Ricans do it. In this situation, make sure you check more than once and even try to make eye contact with the driver. They will usually gesture or blink their lights when letting you go ahead of them. Even though some roads don’t have painted lines in the center, they might still be a two-way street. To be on the safe side, always keep to the right regardless. If you are in a situation where you are stopping to let pedestrians cross, make sure to warn the drivers behind you by flashing your emergency lights to warn them not to pass you by and possibly hit the pedestrian. A good way to avoid damaging your car in one of the potholes is to adjust your driving to some of the of the others on the road. If you see a car maneuvering or slowing down in particular areas, do the same. Especially when driving at night or when it is rainy and the roads are less visible. When trying to find a place on the parking lot, try to find a place when you leave enough room for you to be able to exit again. Ticos tend to park really closely together! Use common sense like you would in situations back home, be vigilant, and always stay calm. Drivers communicate to each other using their blinkers and lights. When you are stuck behind a truck on a mountainous road, they tend to use their left blinker to tell you it is safe to pass by. Always keep an eye on the motorcycles and scooters! There are a lot of them driving around in San Jose as well as the rest of the country and they tend to run red lights as well as sway throughout standing traffic. Make sure you check for these when crossing the streets. In the more rural areas scooters are very common and often carry entire families on them. They too tend to pay little mind to traffic rules so make sure you drive in big curves around them. It may not seem very organized at times, but people do get pulled over by the police for alcohol tests and speeding (over 120 km/h) can be fined with a ticket of over 500 USD. Having over 0.76 in your blood can even result in imprisonment. If a police officer pulls you over, make sure to always have registration ready and if you don’t speak Spanish, they will always be able to get someone who speaks English on the line. Keep a keen eye on pedestrians. Sidewalks aren’t always provided and sometimes they have to walk on the streets. Selecting the right rental company can be a challenge and we are always here to offer you advise on who best to use. Something that is very tempting but an instant red flag are the cheap rental companies. If they are a lot cheaper, this is usually because they omit certain information such as insurance. The safest approach is to go with an established and renowned rental agency such as Abode Rent a Car. Renting a car is a great way to explore the country and we will be happy to tell you more about the car companies you can use and trust!